When we moved into our house, we renovated the upstairs, and one of our goals was to bring the laundry up from the basement. With the kids, we do so much laundry that I knew this would be a huge improvement for us: no lugging baskets up and down the stairs, no descending into the damp basement daily. And, indeed, we love having the laundry close to our bedrooms – well, as much as one can use the word “love” in association with dirty clothes and folding. 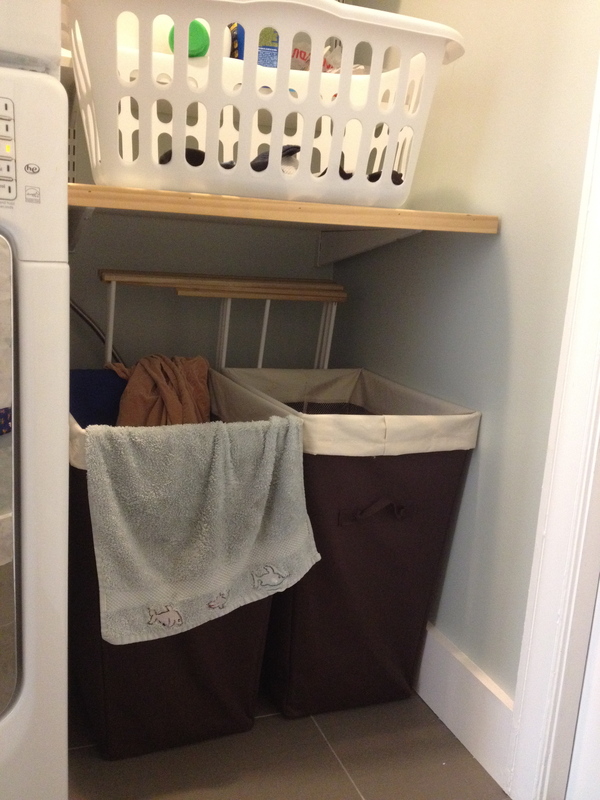 The laundry area moved to a small hallway next to the kids’ bathroom, which makes it easy for them to drop their things in the hamper when changing. The new location also means that we can quickly start loads, without going out of our way, and we can sort and fold in the comfort of a bedroom. Of course, there are limitations to the new laundry arrangement, too. Because the area was added on, rather than part of the original house design, it’s small: just enough room for a stacked washer and dryer and a few shelves. 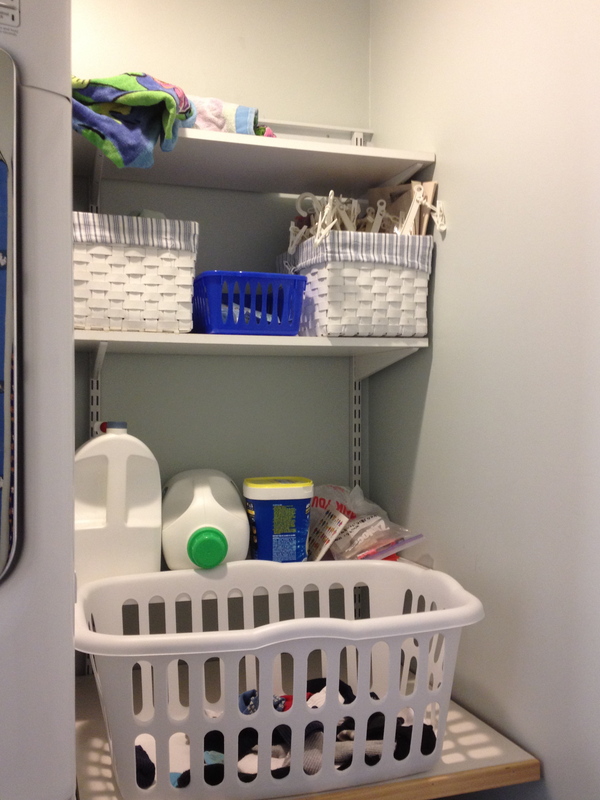 And because it’s in the hallway, the laundry area is constantly visible – no shutting the doors to hide clutter! On the bright side, decorating a small space is a doable project! Here’s our laundry area “before.” Not much to work with but also a manageable task that won’t drag on like our powder room. Most of the examples of laundry room designs feature full rooms, and it was hard to apply those ideas to our little space. 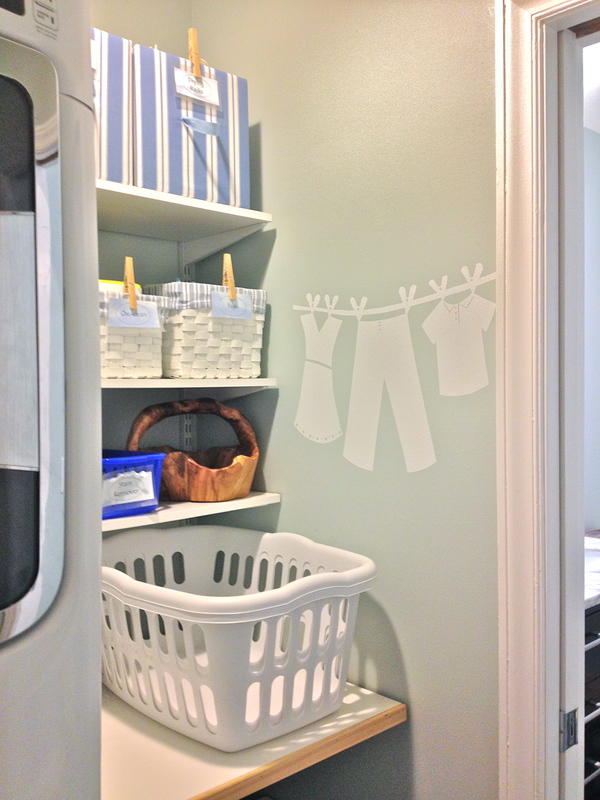 When I saw this laundry closet makeover by Amy at eat.sleep.decorate., I felt like it was just the inspiration I needed! I love the pretty storage baskets – all tied together by the cheerful green color scheme, but varied to give visual interest and a homey feel. I don’t always like designs to be symmetrical, but I think it works here, where there are so many things in a small space. The labels are adorable and functional too – even in a small space, where you basically know where things are, labels really help in both finding things quickly and in keeping things organized – you (and your family members – nah, who am I kidding?) are more likely to return things to their proper place, when it’s clearly labelled. Finally, I agree with her that a touch of art on the wall really makes this laundry area feel like a part of the home, rather than just a utilitarian necessity. My inspiration: Amy at eat.sleep.decorate. created this fresh and organized laundry area. Click the picture to see her entire post with lots of great tips. Hampers for dirty clothes – I like to have separate ones for colors and whites, which makes starting loads easier, though we occasionally get things reshuffled by our toddler! 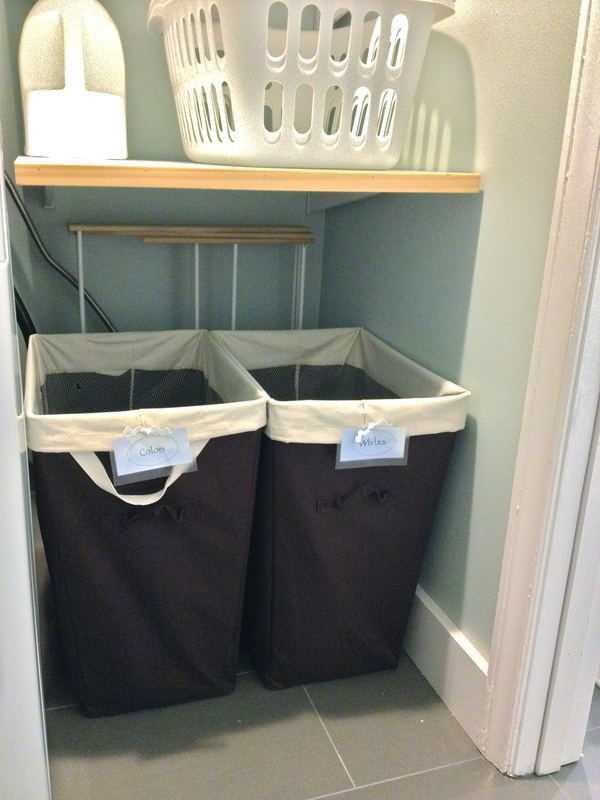 Baskets for clean clothes – I have one labeled for each child and a few extras. Bags – mesh ones for delicates and wet-bags for cloth diapers. Container for coins and other pocket treasures. 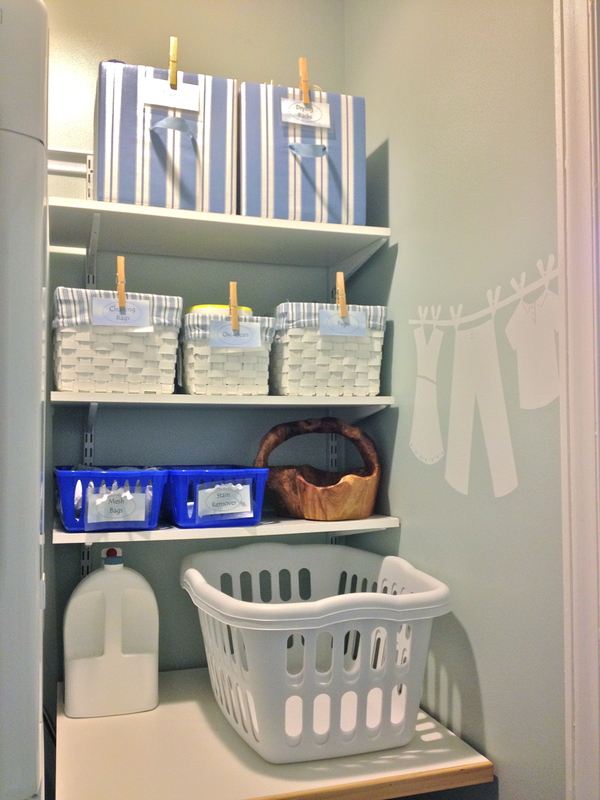 Other – garment drying racks, towels, cleaning supplies, etc..
Then I collected a variety of storage baskets to fit with the blue and white color scheme. Like the symmetry, a very simple color scheme works here, because it makes the area look less “busy.” I made some fabric-covered boxes for the top shelf (more on making those boxes in another post!) and the rest were items we had around the house. I love using the “root” basket for collecting coins and other odd items from pockets. It has a bit more style than you would expect for the laundry room, but I wasn’t using it for anything else at the moment, and its rustic shape and material contrasts nicely with the neat white and blue. I moved around the shelves a little, to make things more accessible, too. AFTER: top of laundry area is neat and bright! AFTER: bottom of the laundry got a little sprucing up, too! Amy used printables for her labels, and I think they look great. I don’t have a color printer, so I decided to print simple labels in black and white on this paper with blue and white clouds. I “laminated” them with clear contact paper and attached them to the containers either with clothespins or rickrack ribbon. For those, I punched holes, attached them to the baskets with safety pins, then hid the pins with a bit of ribbon. 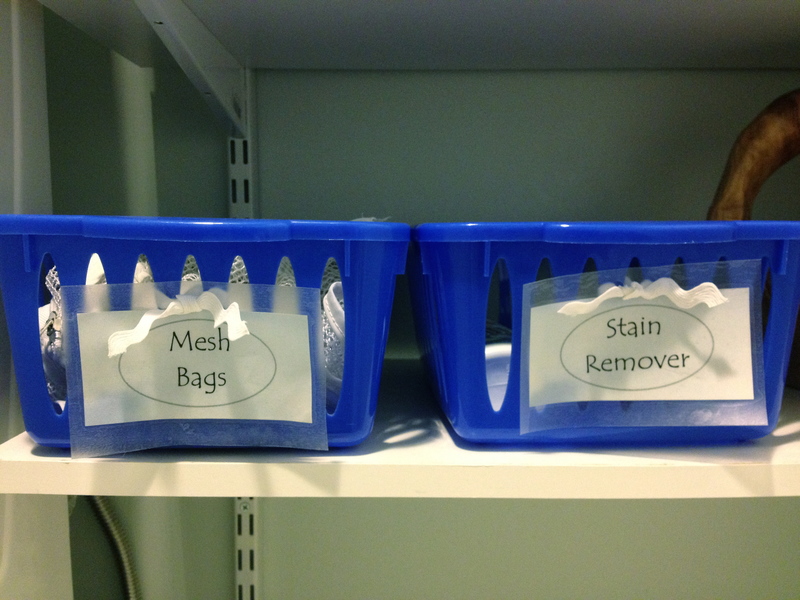 The labels help make the space feel organized. I tied these on with a bit of white rickrack. And for the final touch, some art! There are a lot of great ideas out there for laundry area art – vintage soap ads, wooden signs, etc.. I decided to do a simple wall decal. I’ve been hooked on decals since I did one in our nursery. Etsy has a lot of great ones with cute phrases, clothespin motifs, and more. I liked this laundry line decal and decided to try making one myself. Adorable clothesline decal from Vinyl Wall Accents shop on Etsy. Click the picture to see all their designs and color options. Go to shop on Etsy. To make my decal, I cut a piece of white contact paper the size of the area I wanted to cover. 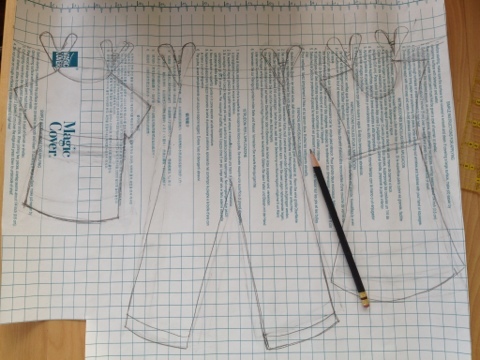 On the back, I sketched my design. If you try this, remember that the finished decal will be a mirror image of your drawing – not an issue in this case, but definitely important if you are doing letters! Also, I freely disclose that I have never tried using contact paper to make a decal, and I’m not entirely sure that it is safe for the wall, but it is supposed to be removable, and from a quick browsing of the internet, it looks like other people have tried this, so I was willing to assume the risk (daredevil, I know!). To make your own decal from contact paper, sketch your design – in reverse – on the back of the paper. Then cut it out and hang! 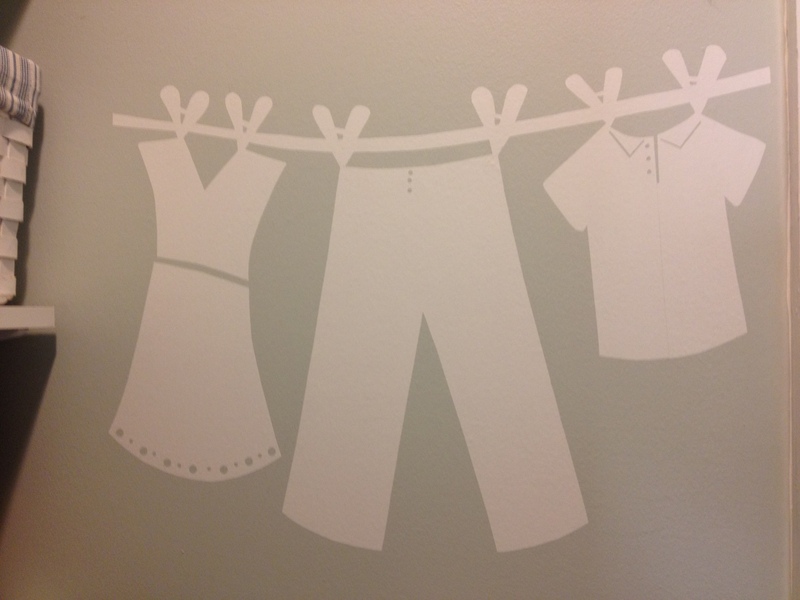 I made the clothesline decal for our laundry area from white contact paper. It adds the perfect finishing touch! Close-up of the wall decal, cut out of white contact paper. By the way, working on this area has made me think about a recent change to the laundry duties at our house. I have been the main person doing laundry in our house (hubby more than makes up for it in the kitchen! ), and it is a lot of work! Recently, our oldest, who is eight, asked if he could earn some money. He had just lost $6.50, most of his saved spending money, because I made him pay for his purchased lunch, the third time he forgot the one his dad packed (told you hubby more than makes up in the kitchen!). So, what I saw was a win-win situation: I could be relieved of some laundry duties, while he could earn some spending money and also learn how to do laundry. The latter isn’t trivial – there was a boy in my freshman dorm who turned his bed sheets pink by washing them with some red clothes. Honestly, this doesn’t just happen in sitcoms; I saw it with my own eyes! A small part of me feels a bit guilty about our kid doing our laundry to earn money, like when he mentioned the other day, “It seems like what is a lot of money to me is not a lot to you,” which is true. But overall, I think we have a great arrangement – my son gets to learn some domestic skills and earn spending money; I get more time to browse Pinterest and do projects for the blog. Okay, I’m (partially) kidding – I do also use some of the time to get ahead on other things around the house. And, I never tell our son he has to do the laundry, but for now, he’s so excited about it that we have to stop him sometimes! So, when you are thinking of home decorating ideas, don’t overlook your laundry area, no matter how small. It’s a place where we all spend a lot of time, so I hope you got some inspiration to make your laundry area a pleasant place to be, too! Great inspirations! I added a shelf and closet to my laundry room but would like to jazz it up with some slick organization baskets like the ones you showed.